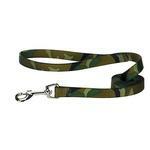 If your dog loves the outdoors, this rugged and durable Guardian Gear® Camo Leads is perfect! Posted On 04/05/17 by Rose B from Braceville, IL Yes, Rose B recommends this product! Perfect Accessory For JoJo's New Camo Harness !!! ???? Posted On 03/29/16 by loril m from New York, NY Yes, loril m recommends this product! Our old leash's fastener actually broke while I was walking our dog Chewie. Luckily I was able to rescue him (he is an escape artist). Baxter Boo leads the way in leashes This new and improved leash has a much sturdier clip fastener and is longer. Perfect. Thank you BB for keeping our Chewie safe. Posted On 06/03/15 by Chastity M from Howard, PA Yes, Chastity M recommends this product! Highly recommend. Great value for such high quality. Great length. Love it Love it Love it. Great price and holds up great. Posted On 03/18/15 by Melissa Turner from Martinsville, VA Yes, Melissa Turner recommends this product! Love the leash. It is a perfect length and matches the harness perfect. Posted On 01/23/15 by Teresa R from Waxhaw, NC Yes, Teresa R recommends this product! I bought this leash to go with Frankie's Camo Puppia Harness! It looks awesome on him! I have loved every product I have purchased from BaxterBoo to date. I look forward to receiving my next order shortly. Shipping is timely and communication thorough. I think Scooter will like her new harnesses too!